From the point of view of the body, I am Your servant. From the point of view of the mind, I am a part of You. From the point of view of the Self, truly, I am You. What Spiritual Realizations are possible? How does Spiritual Realization relate to ordinary views of human potential? What is the ultimate Spiritual Realization? Is there such a thing? And if the ultimate Spiritual Realization is our aim, it is very good to know the final destination before setting out, both in order to choose a vessel capable of getting us there, and to avoid sidetracks (leading to lesser Realizations) that prolong the journey, even indefinitely. And so, by way of comparison, we will first sample some conventional views of human potential and destiny, and then lay out the Ultimate Destiny that is possible for us. Common views on human potential and destiny — The common views on human potential include the materialistic view of self-fulfillment, and the religious views of heaven. The Perfect Realization and the Ultimate Human Potential and Destiny: the Perfect Happiness of "There Is Only God" — The common views on human potential sell us far short of our true potential of Eternal and Perfect Happiness. Unlike a mere experience, a Spiritual Realization of any degree involves a fundamental and permanent shift in one's sense of reality — All of us may have great experiences, even truly Spiritual ones, now and then. But a Spiritual Realization is not just a passing experience. It is a permanent change in one's sense and awareness of reality. 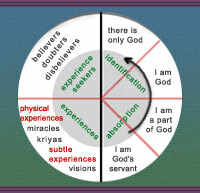 God-Realization  our ultimate human potential  involves a series of permanent shifts in identity until the Ultimate Divine Identity is Realized — Shift in one's sense of reality goes hand in hand with shift in identity. If I am just the material body, then I only have access to my physical senses, and all I am aware of (through those senses) is physical reality. But if I am not merely body but spirit, then I have access to the spiritual (or "subtle") senses of the spirit that make me aware of spiritual reality. Realization also involves a deepening in self-understanding and self-transcendence — Shift in identity goes hand in hand with greater self-understanding, since it is the unconscious activity of self-contraction that is keeping one locked into one's currently limited identity. One's identity, one's sense of "self", will never change unless one understands how one is artificially (and unnecessarily) creating the sense of self through the activity of self-contraction. Realization involves discriminating, in feeling, between "God" and (the activity of) "self" — We could never discover the activity of self-contraction (that creates our limited sense of self) without the contrasting Presence of the Divine Self. It is only by way of that contrast, between Bright and dark, between the Limitless and the limited, between the Happy and the un-Happy, that we discover, first, the incredible limit that "self" represents on the scale of our ultimate potential; second, the capacity to feel to, through, and beyond the "self" sensations to God; and third, the nature of self as activity that can be transcended.